The original White Dog Cafe opened in 1983 in University City, under the founding guidance of Judy Wicks. She was a clear pioneer in the farm-to-table and locally sustainable food movement that's on trend these days. And to that end, the majority of ingredients are sourced no more than 50 miles away. In 2009, restaurateur Marty Grims (think: Moshulu & Autograph Brasserie) bought White Dog Cafe, under the proviso that the same environmentally sound model would be continued. And with Grims' expertise and experience, White Dog Cafe has grown, with a second location opening in Wayne and a third in Haverford. 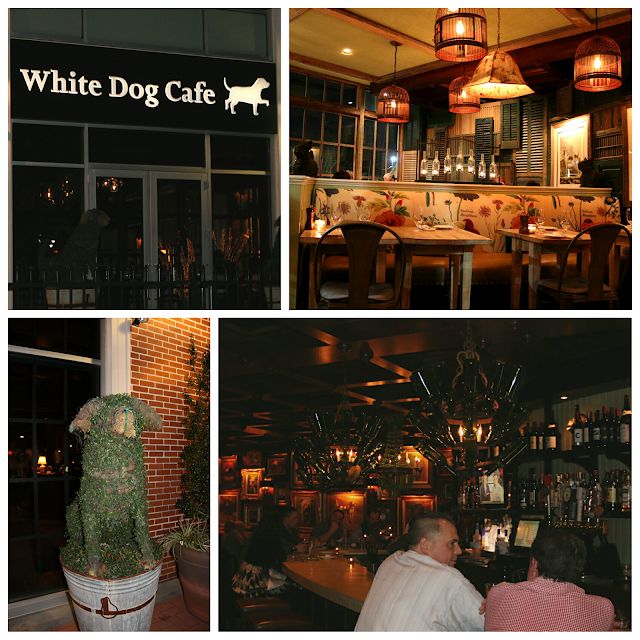 Similar to Autograph Brasserie, White Dog Wayne is simply stunning. Whimsical dog decor and artwork abound, with a Library room featuring dark mahogany ceilings and flying books. Looking for a place to host a baby or wedding shower? Book the Garden Room, which has chicken-wired ceilings, floral prints, and antique light fixtures and wooden shutters. 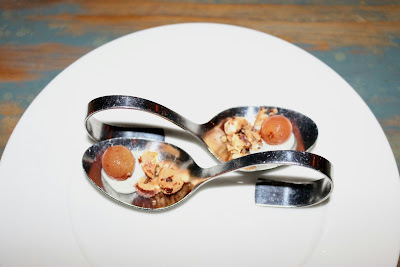 Dinner started off with an amuse sent out by the Chef. Pickled grapes had sharp acidity to balance the smooth funk of the blue cheese mousse, with the rich Marcona almonds offering a nice textural contrast. 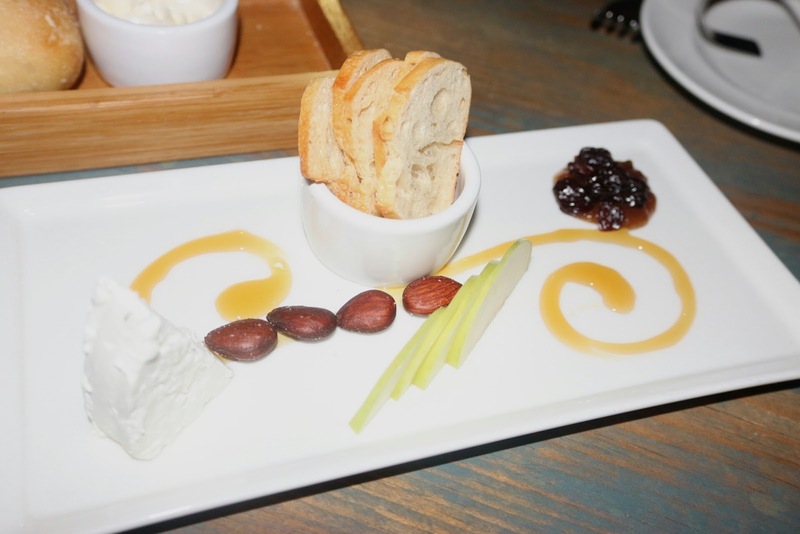 A hefty slab of local creamy goat's milk cheese had a nice tang that was accented by the sweet honey, apples, and jam. 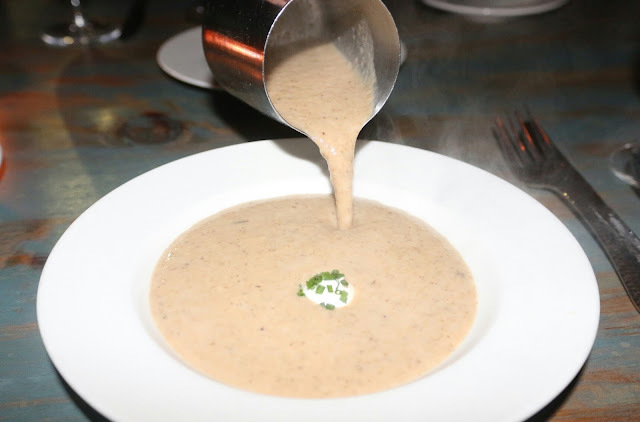 The mushroom soup is definitely a must-order for first timers. A heady, umami-laden broth of Kenneth Square mushroom soup is poured tableside, with creme fraiche to provide some levity. I appreciated that the white truffle oil served to accent and not overpower the dish. 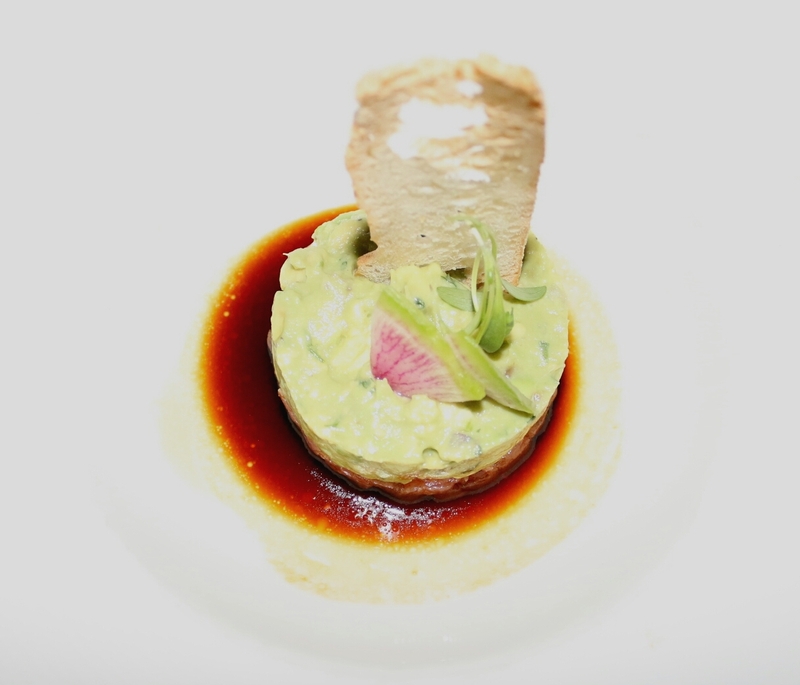 White Dog's tuna tartare can go head to head with any fine dining establishment in the city - artfully presented and well-executed with a creamy avocado salsa atop freshly chopped tuna and a sesame soy emulsion. 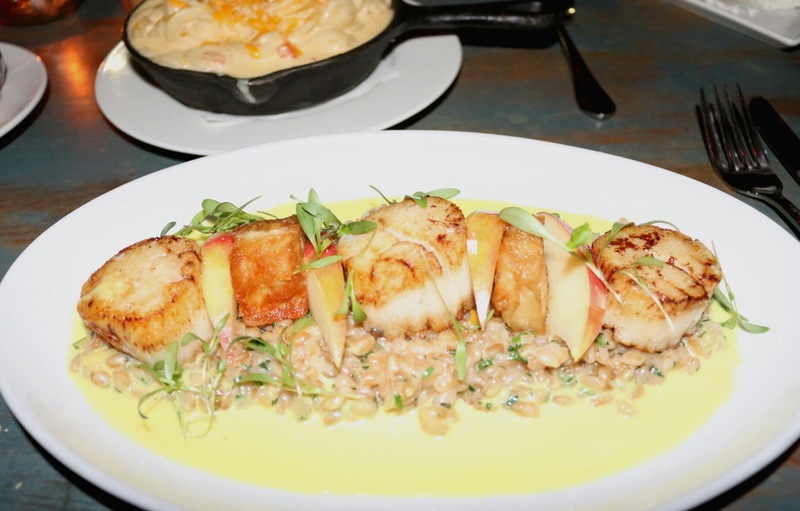 Without a doubt, scallops and bacon were clearly made for my tastes and porcine sensibilities. The well-seared scallops were sweet and had a beautiful crust. Paired with the roast pork belly and the hearty farro risotto, the richness was undeniable. Balance was offered by the yellow curry butter and the crisp apples, which provided a countervailing element to each bite. Easily one of my favorite mac's in recent memory, this was baked in a cast-iron skillet, with a liquid gold lava of fontina and sharp cheddar interspersed throughout al dente orchiette pasta. 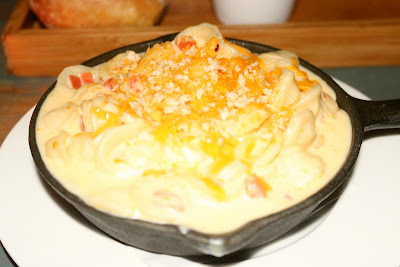 I appreciated the shredded sharp cheddar and buttered bread crumbs on top, offering additional layers of texture. 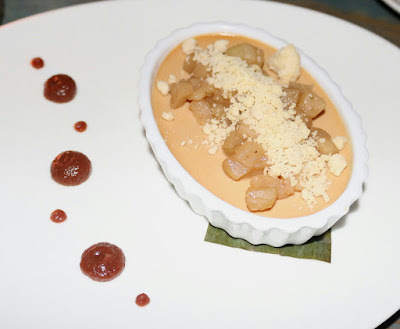 The seasonal dessert menu featured a light caramel pot de creme, with plenty of confited apple chunks and pie dough crumble on top. The tartness of the apple butter dollops helped to provide some slightly acidic balance to tie things together. And it wouldn't be White Dog Cafe without the doggy cookie jar. Served with a glass of milk, the cookie jar opens up to reveal plenty of freshly baked and warm cookies. Buttery dog-bone biscuits, hearty oatmeal raisin, and decadent chocolate chip cookies helped to end the meal with a sweet and comforting note. White Dog Wayne is clearly a hot spot for Happy Hour. And by prime time, the bar's bustling and the tables are filled with diners enjoying their meals. Chef Zach Grainda is at the helm in the kitchen and has a clear passion for creating an ever-changing menu that speaks to what's locally available, fresh, and seasonal. White Dog Wayne is certainly a driving force behind Main Line's destination-dining boom. 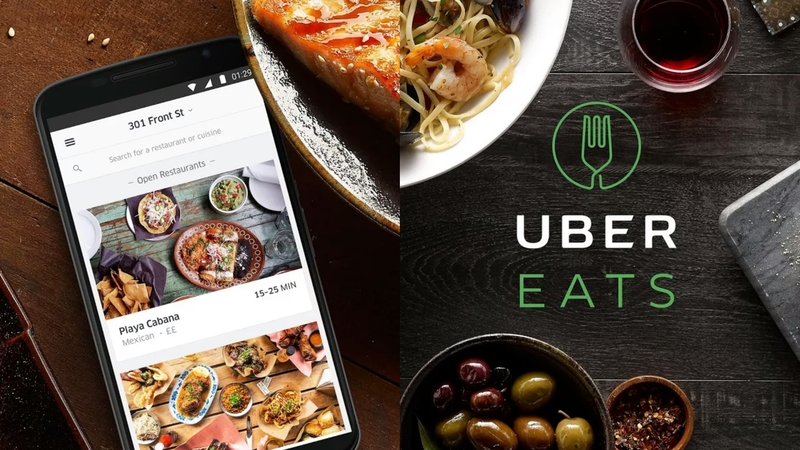 I've said it before - suburbanites need not go to Center City to get creative, beautifully presented, and delicious dishes. FTC Disclaimer: I was invited by the Fearless Restaurant Group to visit White Dog Wayne. Regardless, my opinions are mine alone and, therefore, unbiased.